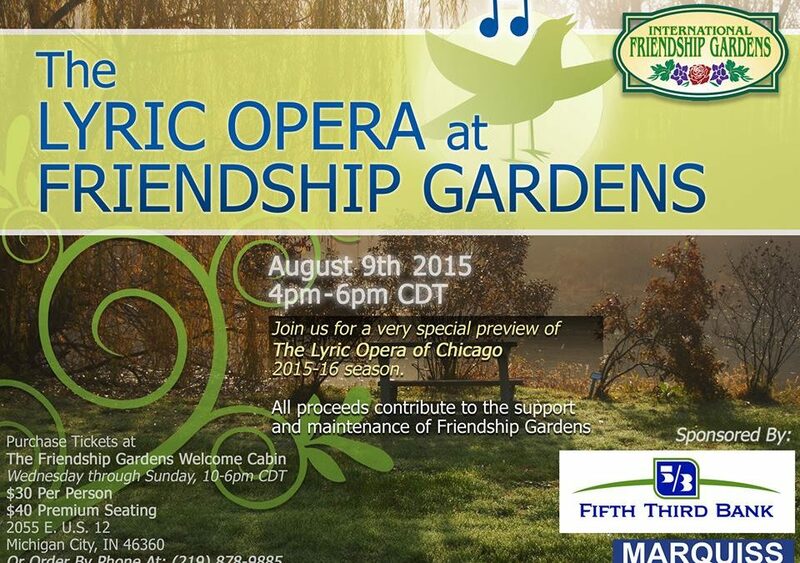 Rose Guccione, soprano, Janet Mensen Reynolds, mezzo-soprano, Kenneth Donovan, tenor, and Keven Keys, baritone, together with Robbie Ellis, pianist, and Gary Alexander, narrator, present a concert of selections from the Lyric Opera of Chicago 2015-2016 Season at the International Friendship Gardens in Michigan City, Indiana on Sunday, August 9, 2013 at 4:00 p.m. General seating tickets are $30 and now available at the Gardens, and by phone. All proceeds contribute to the continued restoration and maintenance of Friendship Gardens, a historic 105 acre botanical park in Michigan City that serves as the region’s premiere destination where nature meets culture. Tickets are available at the Friendship Gardens Welcome Cabin, open Wednesday through Sunday, 10am – 6pm CDT, or Order By Phone at 219-878-9885.